Police are appealing for information about a man police believe is linked to distraction burglaries in the West Midlands and Manchester. John McDonagh, 41, a member of the travelling community, is on a police "most wanted" list suspected of burglary and breaching prison recall. He is wanted in connection with burglaries in which a man posed as a council worker, charity worker and Pc. He targeted elderly people living in Balsall Heath, Yardley and Kings Heath. Cash was stolen in the burglaries. McDonagh, who was sentenced for handling stolen goods in October 2009, has also been linked to a distraction burglary in Manchester. Police have described him as white, about 5ft 7ins tall, slim, with cropped black hair and green eyes. Det Ch Insp Nick Walton, from West Midlands Police, said: "McDonagh has a history of distraction burglaries, and will probably be committing crime now, so clearly we are keen to catch him and stop him from committing any more." 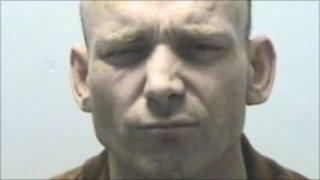 McDonagh, who goes by various aliases, has been added to the "most wanted" section of West Midlands Police website.